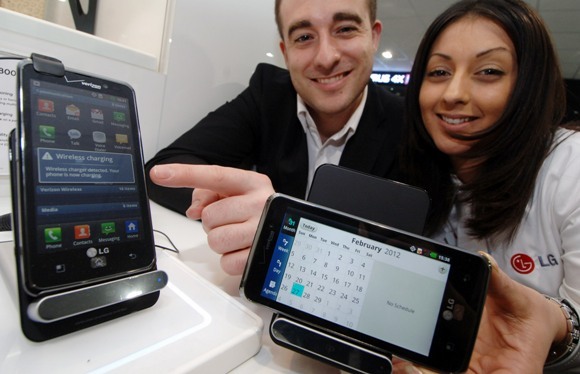 LG Electronics has unveiled its newest advanced wireless charger, WCD-800, at the Mobile World Congress. The WCD-800 is designed in the shape of a cradle to allow to the phone to be positioned vertically to make video calls and send text messages or horizontally to view TV programs and HD movies while charging. LG’s newest charger allows you to charge your handset wirelessly without the need of any wires. With the WCD-800, charging is accomplished by simply placing the phone on the deck of the 75.8mm wide cradle. The charging area is double the size of LG’s previous wireless charger, the WCP-700. Using electromagnetic induction, the WCD-800 relies on electric currents produced by the magnetic fields of the electric coils located under the charger. Despite its unrivaled convenience, the WCD-800 exhibits efficiency and effectiveness equivalent to that of conventional wired chargers. LG’s wireless charger is compatible with all devices compliant with the Wireless Power Consortium’s Qi standard, the global standard for wireless power. The WCD-800 will be introduced first in Korea followed by North America in the first half of the year.